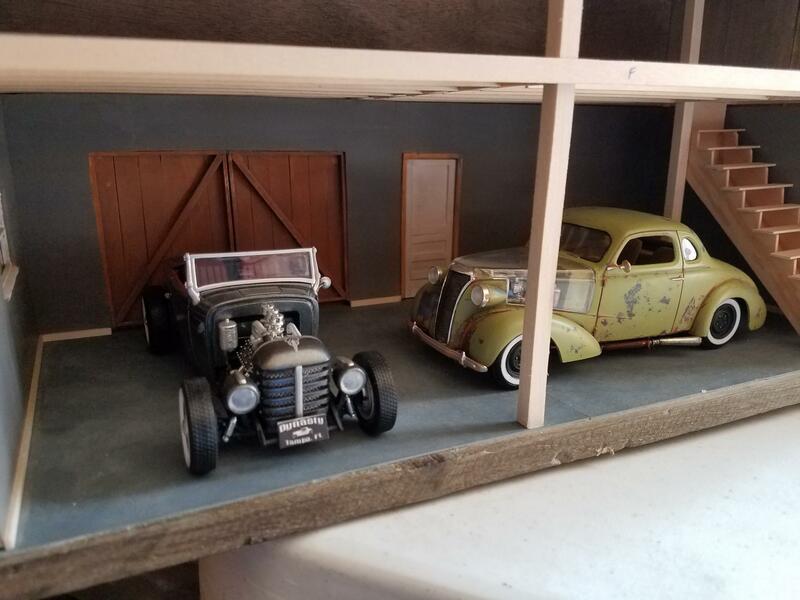 I've been wanting to do a shadowbox garage scene dio for a while. I finally found a box. Good size. 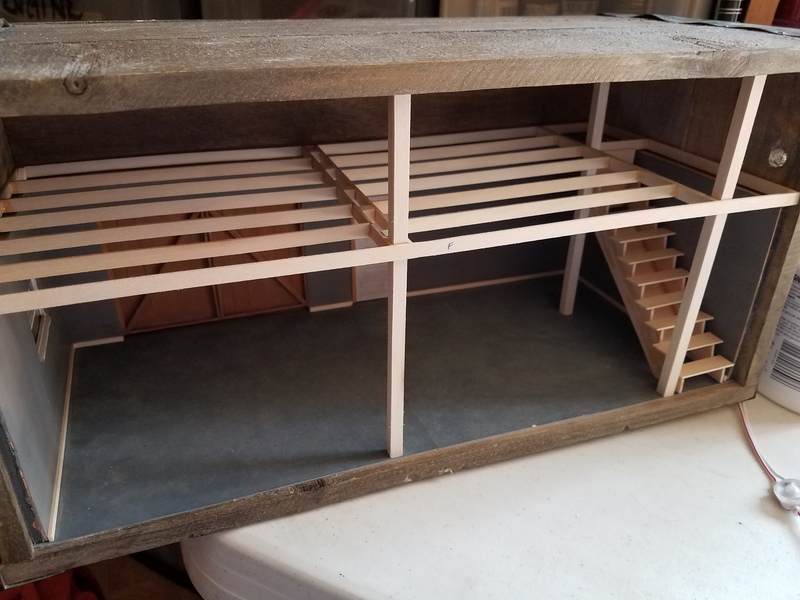 Plenty of room for two models. Hobby Lobby item, its got a nice patina. 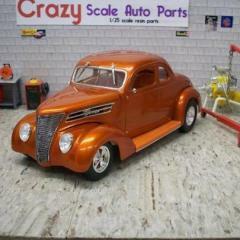 In scale, the interior dimensions are 31.2 feet long and 14.5 feet deep and high. 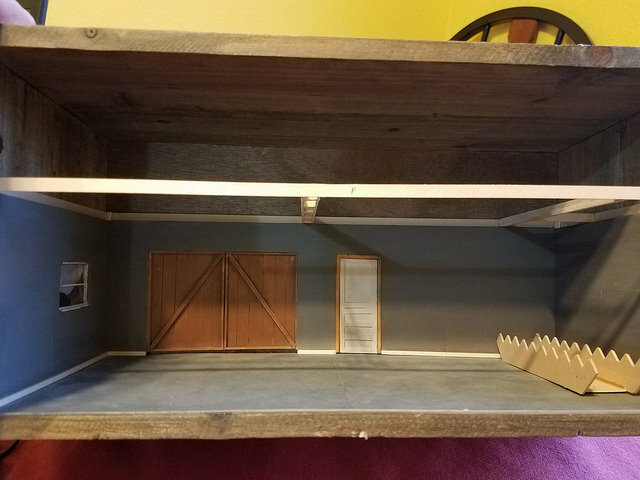 The plan is to do a lighted garage scene with a crawl space above for storage. Rather than do the bare framed garage, I've decided to do the garage that's been plywood sheathed. One window, double barn doors, concrete floor, one door. I'll be using washes to get an aged patina on the wood, with color added to break up the "man that's a lot of wood". The walls are basswood over foam core. 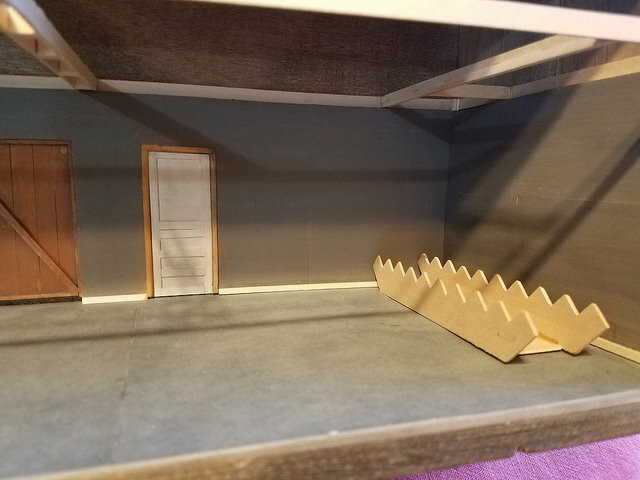 The foam core will give me some depth for the windows and doors as well as a support for the ceiling which will be framed out to look realistic. I cut out templates from poster board for each wall and then cut the foam core and added the basswood over that. 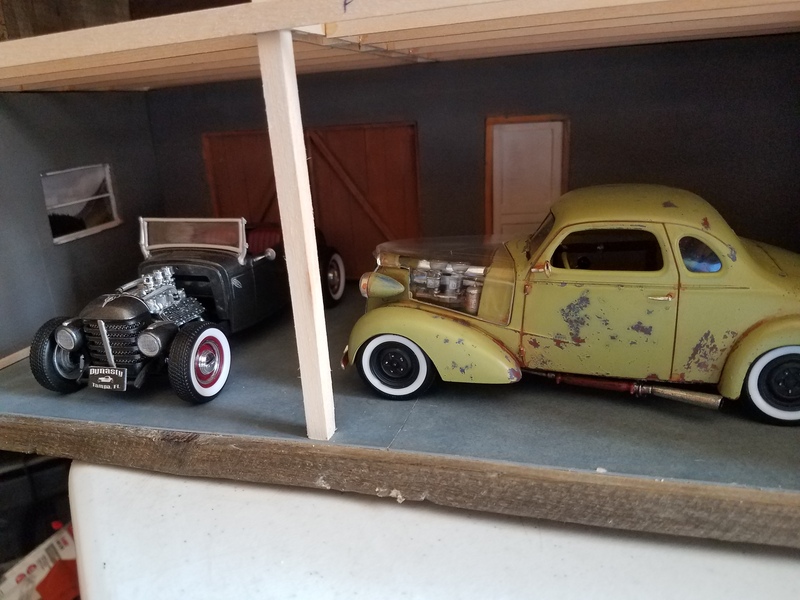 I'm gonna need to get some resin garage pieces or a Fujimi garage set. Here's where I'm at so far. Great start! It looks very promising! 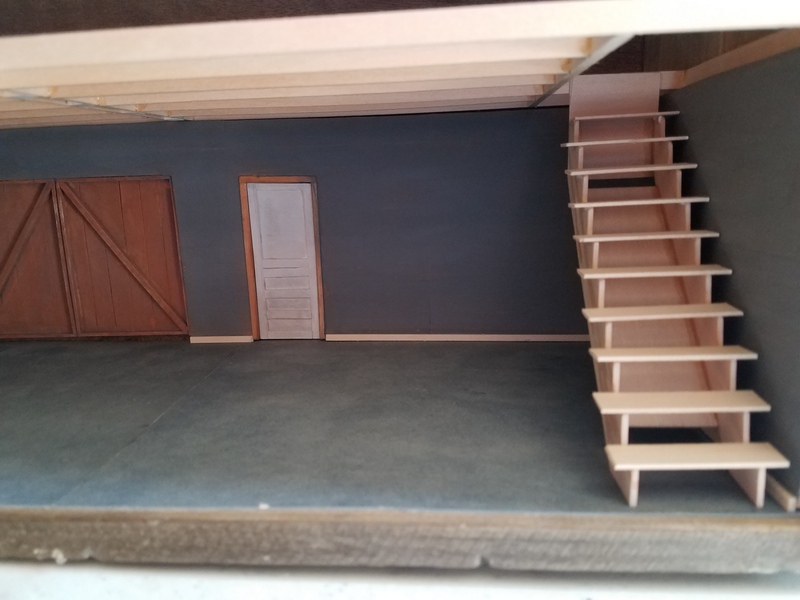 This is an interesting way to approach building a diorama. I like it and will watch this one with interest. I like this idea the whole nine yards. Looks better with the rope removed. Agreed. One of the holes will house the switch for the light. Cool idea. Looking forward to your progress. Thanks guys. This will be a long term project. A break from working on cars. My issue right now is the design of the door. Working in it. I did something very simple for the floor. Grey primer over two comic book backer boards. It's just thick poster board really. But with a light coat its mottles very nicely. I'll add patina as I go. I still need to figure out what car goes in it. Hot rod or muscle car? 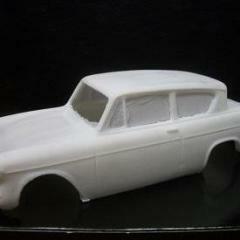 Something completed or do a work in progress with chassis on one side, body on the other? I have a few options, but I'm leaning toward an AMT '63 Shelby Cobra. The window is framed out. I have glass and will be putting a photo behind it. It's time to start painting! Well I took a day off and the family is leaving me alone sooooooo.........Painting has begun. I'll be adding washes hear and there. I have restored the photos in this thread. 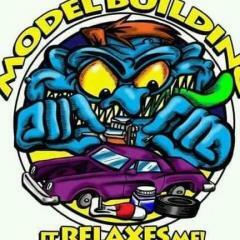 I'm working on this one off and on with my car builds. More soon. I like your approach to this diorama build Rob. I shall make a point of following your progress with interest. Plenty of wood.... that's good! Finally some more work on this one. I've made a jig for the balcony. And I've started the stairs. It's coming along slowly. More soon. 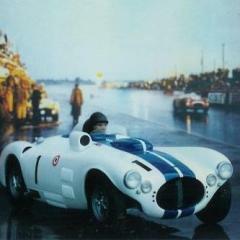 I think using a Shelby Cobra is an outstanding idea ! I really like what you have done here and look forward to seeing more soon. Thanks David. I don't recommend the foam core. Once the "plywood" was glued on, they curled up badly. It took a while under some bricks to flatten out again. I'm not sure what I would use in it's place. I have the balcony all framed out and I'm working on the staircase. 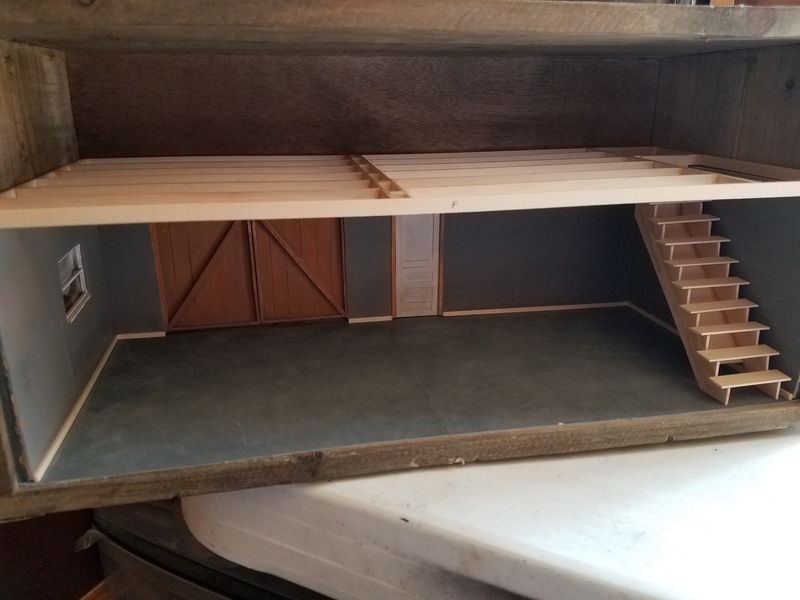 I plan on adding some lighting so I'll have to do some soldering and wiring before I lay the balcony flooring. Pics tonight. I'll be watching with interest, excellent work so far! You mentioned the foam core, and not being able to recommend it...... 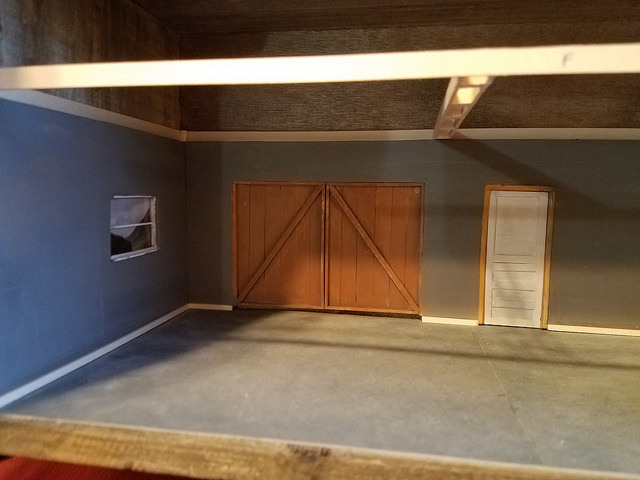 I myself have experienced some issues with foamboard, and I do prefer the plywood parts of my diorama building. Warping seems to be the main issue, and like you I am not sure what to use in place of this material which does have some advantages. Good luck with the lighting, the wiring and soldering. Some more work done. Gotta figure out the lighting before I go much further. Im no framer but this seems close enough. I added some models for scale.